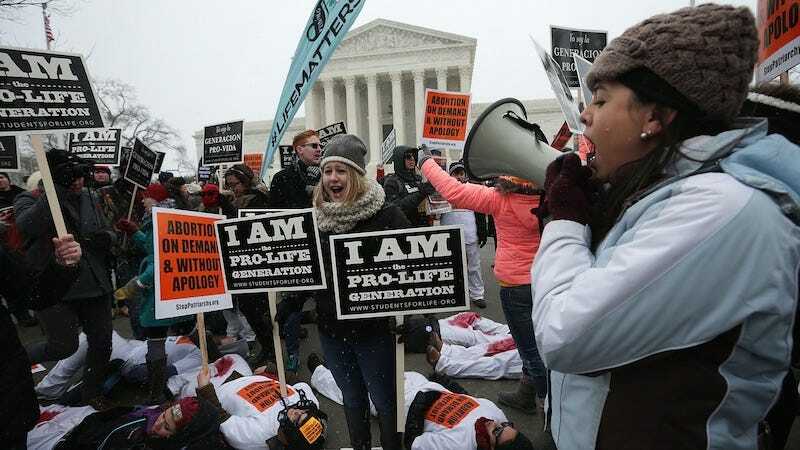 On Monday, the Supreme Court forbade North Dakota from enforcing a “fetal heart beat law” which would ban abortions if a heartbeat is detected, even as early as six weeks into a pregnancy, according to the Associated Press. The 8th U.S. Court of Appeals initially blocked the 2013 law which had been challenged by the Red River Women’s Clinic in Fargo—the state’s only abortion clinic. In the North Dakota case, the appeals court had said it was bound in its ruling by U.S. Supreme Court precedent on abortion, which holds that states may not prohibit abortions before a fetus reaches viability. But the appeals court said “good reasons exist” for the high court to re-evaluate its past abortion decisions in light of medical and scientific advances that show the concept of viability is subject to change. “Since this Court first recognized constitutional protection for pre-viability abortion, two generations of American women have come of age, depending on constitutional protection for their dignity in making reproductive decisions,” the Center for Reproductive Rights said in a statement. The Supreme Court recently refused to hear a case overturning the ban of an Arkansas law that would ban abortions at 12 weeks. Although abortion is legal in most states in the U.S. until a fetus becomes viable, which occurs at 23 or 24 weeks into a pregnancy, Republican lawmakers have attempted to broaden that ban to 20 weeks and even earlier.